Please be aware that a Safety Zone around the barge will be implemented and patrolled, and vessels that are too close will be subject to boarding and heavy fines. Coast Guard regulations will be strictly enforced for your safety and those around you. Please comply with any instructions from one of our SAFETY PATROL VESSELS that are marked with Privileged Vessel flags and/or flashing orange and red lights. They are volunteers and only trying to protect you and comply with the Coast Guard Requirements. Please see the following chart for an approximate barge position and size of the safety zone. This is just for your orientation. The actual barge position and safety zone is determined on the day of the fireworks by the Harbormaster and Fire Chief! Low tide on Wednesday, July 4th 2019 will be at 07:13 PM EDT, so it will be quite low at the start of the fireworks. What that means for those of you arriving by water is that you will probably be arriving and anchoring during a falling tide in the late afternoon and early evening, so you should account for the tide in your anchoring scope. Extra caution should be exercised in and around Marblehead and Salem Waters for those vessels transiting the area after dark. Remember your night vision may be slightly impaired after watching 1/2 hour of fireworks so be aware and be cautious. Anchoring will be allowed outside of the Safety Zone. 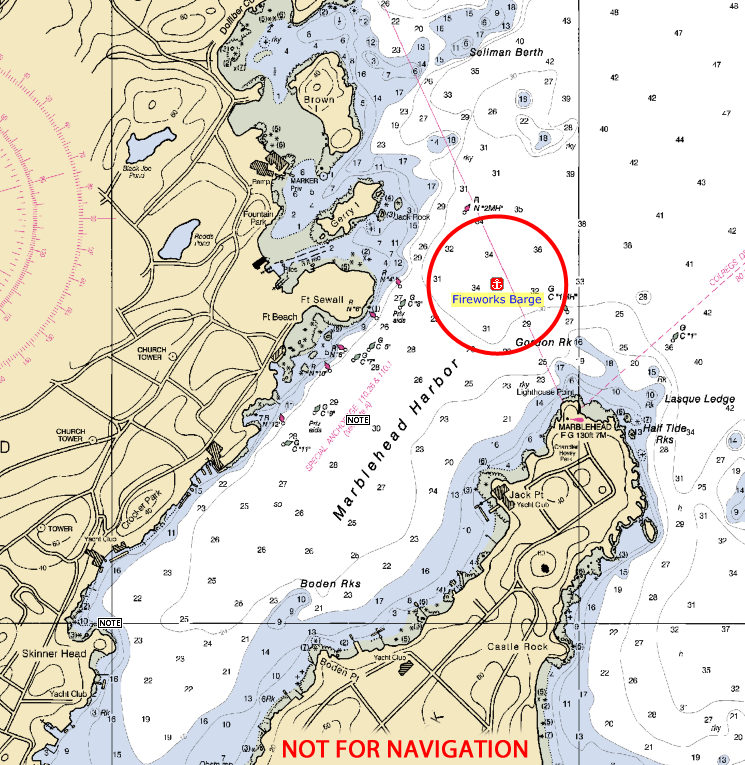 Please check with the Marblehead Harbormaster for chart coordinates and information about Marblehead and surrounding harbors and please use your Common Sense.